Enjoy a live original performance at Lochwood Library with Reader’s Theater. 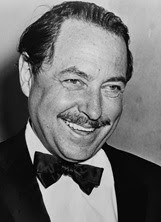 This work focuses on the life of the playwright Tennessee Williams and his friendship with his literary agent, Audrey Wood. The original script is drawn from letters and memoirs of Miss Wood, and performed by members of One Thirty Productions. This is the first of four performances in the 2018 series. 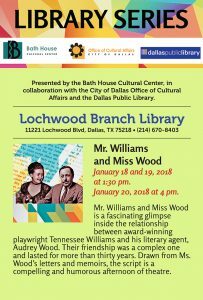 Made possible by the Bath House Cultural Center, the City of Dallas Office of Cultural Affairs, and the Dallas Public Library.